Granger native Kayzie Priebe Weedman has more “competitive suits” than most Half Ironman. GRANGER, IN—Blood, sweat, and tears—and grime—and grease—and, if you are familiar with Grete Waitz’s London and New York Marathon finishes and Sian Welch and Wendy Ingraham’s 1997 Ironman finish, many other gruesome adjectives can be used to describe endurance athletics. But never would we think pageant, beauty queen, and makeup. This is what drives Mrs. Indiana, Kayzie Weedman. In fact, proving people wrong is just what she does. Kayzie did her first race, the Chicago Marathon, in 2013 just because her dad told her she could never finish. She has since completed the Disney Princess and Dopey Challenge marathons besides a few half marathons including our local Sunburst half. But let’s face it, lacing up for a marathon does not carry the same anxiety as putting on goggles as you stand before the body of water you have to conquer. 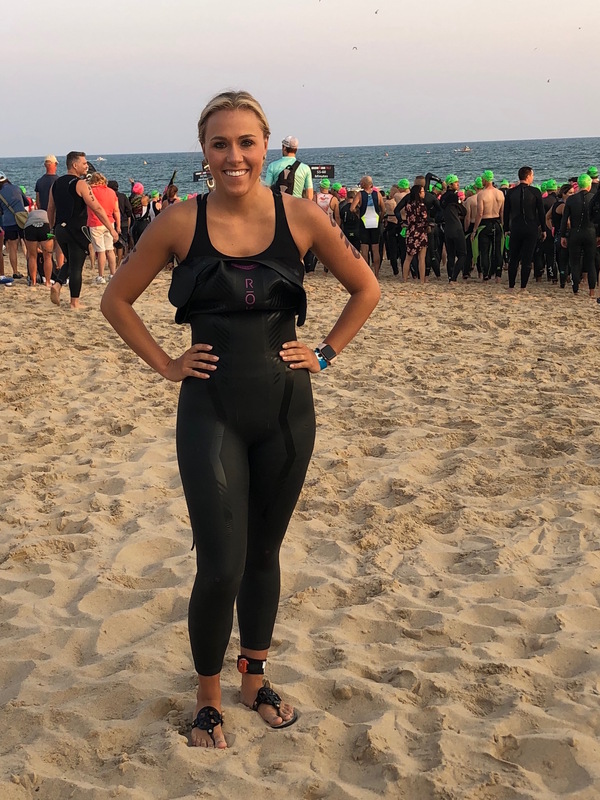 This summer, Kayzie competed in—and completed—the Steelhead 70.3 on Aug. 18 in Benton Harbor, MI. Simply because her husband sarcastically said she couldn’t do it. This summer, the Diamond Lake Triathlon on July 17, was her first triathlon. Scared to death of the open water, she completed the 500-yard swim in a full wetsuit. But completed is the operative word here. “If I get through the swim and don’t die I’ll be fine. I think that’s how most people are. I could be last and I don’t even care.” She said the bike is her strongest event. But hammering your bike hard isn’t quite so simple when you know you will have to jump off and then run with blown quads. Learning how to balance all three sports depending on the distance, weather, and course takes experience. The more triathlons you do, the easier it gets—not easy, but easier. Flashing a winning smile and her Steelhead Ironman 70.3 medal. Kayzie sounds like many of us facing our fears and preparing to accomplish something brave, whether it is a specific time goal or a difficult course or distance. “Who cares about the outcome as long as I finish. 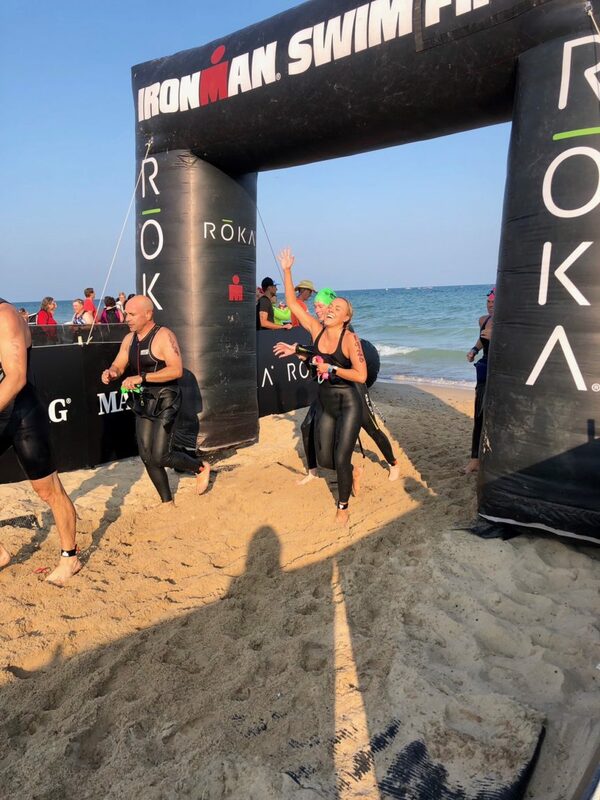 I didn’t put expectations on myself because I don’t want to be disappointed.” Her first goal was only to finish in the official time of 8 hours and 30 minutes. Her best-case scenario; finish in under 7 hrs and 30 minutes. She finished just shy of best-case at 7 hours and 43 minutes. We all set similar goals for ourselves—a “I’m- having-an-awesome-day” goal and a “this-isn’t-my-day” goal. So what sets her apart? How many of you will be completing your triathlon with perfect eyebrows still intact and a face of makeup? “When I look good and feel good I do better,” says Kayzie. Mrs. Indiana was sported head-to-toe in hot pink for the event, including a Betty Designs tri suit which are stylish yet badass tri suits for women. She changed her clothes between events, for the ultimate comfort, especially for the 56-mile bike ride that tends to wreak havoc on your undercarriage. There is a women’s triathlon forum on Facebook that has discussed how triathlon isn’t pretty at all. You will suffer embarrassing tan lines, grease marks on your clothes and legs, large quads and glutes, salty skin and helmet hair. But, male or female, that isn’t what the sport is about. It’s the inner drive and sense of accomplishment at the finish that keeps us coming back for more. Yet what makes endurance athletics insurmountable to so many? Why does less than one percent of the population accomplish an Ironman finish? Mentality. “The hardest thing about training is mental. Endurance sports are 80 percent mental,” she said. 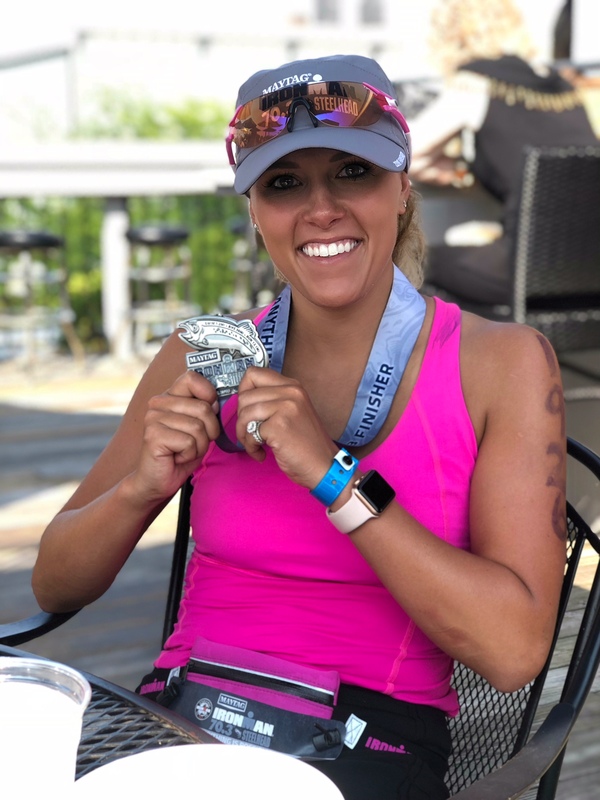 Kayzie has her eyes on Ironman Wisconsin 2019; and on Sept. 1 she opened her own boutique, the Pink Pineapple, in Heritage Square, Granger.